Product #2517 | SKU AE4100 | 0.0 (no ratings yet) Thanks for your rating! Audio-Technica's high-performance AE4100 cardioid dynamic vocal microphone delivers aggressive sound that stays up-front in the mix. 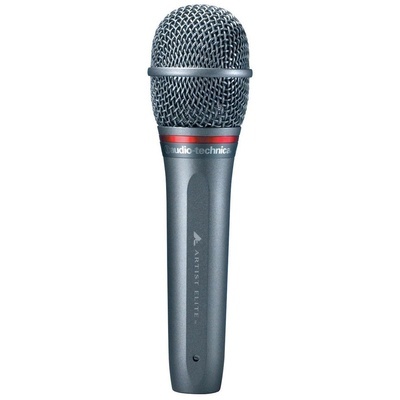 Optimized for the stage, the microphone features superior anti-shock engineering for minimum handling noise. Its rugged construction is engineered to stand up to the rigors of touring. For ultimate protection against vocal plosives, the mic's hardened-steel outer grille is lined with fine steel mesh and a layer of open-cell foam. A foam disk positioned on top of the element assembly provides the final layer of 'pop' protection.